Today marks the 100th birthday of the woman who made Knoll Modern Always. Born to a baker, and orphaned at age twelve, Florence Schust grew up at Saginaw, Michigan. Schust demonstrated an early interest in architecture and was enrolled at the Kingswood School for Girls, adjacent to the Cranbrook Academy of Art. While at Kingswood, Florence befriended Eilel Saarinen, whom she would later study under at Cranbrook. Warmly embraced by the Saarinen family, Florence vacationed with them in Finland, enjoyed the company of their accomplished friends, and formed a very close relationship with Eliel’s son, Eero. The connections she made and the skills she developed while at Cranbrook were the foundations of Florence Schust’s incredible design education and pioneering career. With recommendations from Eliel Saarinen and Alvar Aalto, Florence went on to study under some of the greatest 20th century architects, including Walter Gropius and Marcel Breuer in Cambridge and Ludwig Mies van der Rohe at the Illinois Institute of Technology. In 1941 Florence moved to New York where she met Hans Knoll, who was establishing his furniture company. With Florence’s design skills and Hans’ business acumen and salesmanship, the pair, who married in 1946, grew the nascent company into an international arbiter of style and design. In creating the revolutionary Knoll Planning Unit, Florence Knoll defined the standard for the modern corporate interiors of post-war America. Drawing on her background in architecture, she introduced modern notions of efficiency, space planning, and comprehensive design to office planning. Ms. Bassett’s “paste-up” method of space planning—a practice she began at London’s Architectural Association and perfected at Knoll—has been a real revolution. The Planning Unit rigorously researched and surveyed each client — assessing their needs, defining patterns of use and understanding company hierarchies — before presenting a comprehensive design, informed by the principles of modernism and beautifully executed in signature Knoll style. Florence and the Planning Unit were responsible for the interiors of some of America’s largest corporations, including IBM, GM and CBS. Florence Knoll was no stranger to spatial constraints, having designed Knoll’s showrooms in New York (1951), Milan (1954), Dallas (1956) and Los Angeles (1960). Each location presented its own set of architectural challenges, which she turned into opportunities for innovation. She was very sensitive to regional tastes and endeavored to create spaces that communicated Knoll’s design ethos through the aesthetic lexicon of city. Ms. Bassett ardently maintained that she did not merely decorate space: "the only place I decorate is my own house", she said. As an architect, she believed her duty was to create spaces in order to satisfy people’s needs. What today is a common concept – office setting up aesthetically geared towards work processes – back to 40s was still an un-walked ground. Florence Knoll was able to explain to her client that “good design is good business” and transferred to managers, all men at the time, modernity’s mantra: authentic materials, simplicity and functionality. The renowned Lounge Collection should have been just a secondary aspect of her activity as an architect. Anyway, 1954 sofa by Florence Knoll was intended to become a great classic, inspiring generations of designers. It’s not about a revolutionary piece, such as the Tulip Chair by Eero Saarinen: whether armchair or two/three seats sofa, Florence Knoll’s collection of settees wasn’t meant to catch the attention, but to become a functional element of an overall project. “Meat and potatoes” these creations were ironically defined by Florence herself. Rational distribution of spaces, materials and colours chosen according to Gestalt principles: a consumption design, a filler, just like meat and potatoes consumed in everyday meals. The development of her linear collections of furniture reflects these guidelines and is inspired by Mies van Der Rohe, her teacher when she studied in Chicago. As she stated, one of Mies most important lessons was to reduce something to the absolute minimum, working only on the most linear shapes of design. After the tragic death of Hans Knoll in 1955, Florence Knoll led the company as president through uncertain times. 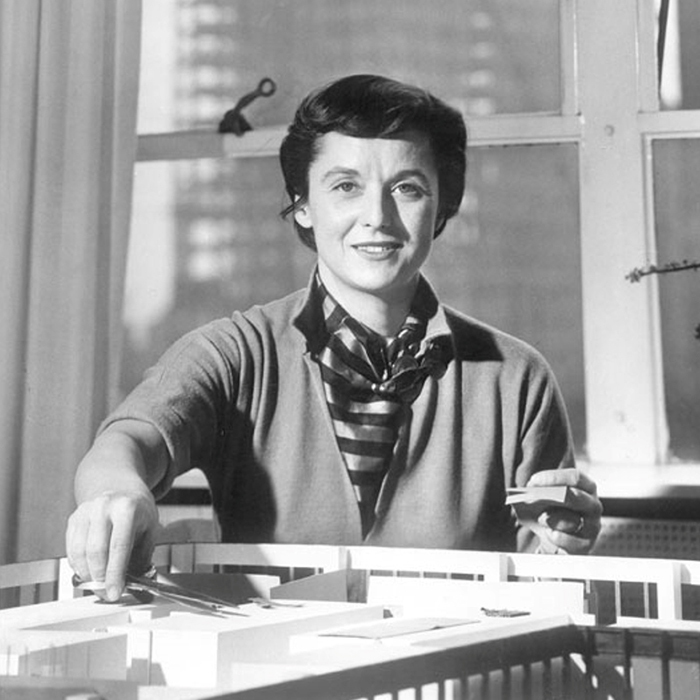 In 1960 she resigned the presidency to focus on directing design and development and, in 1965, after pioneering an industry and defining the landscape and aesthetic of the corporate office, Florence Knoll Bassett (she remarried in 1957) retired from the company. In 2002, she was honored with the National Medal of the Arts. Furthermore, in 2004, the Philadelphia Museum of Art and Knoll, Inc. persuaded Knoll's retired cofounder, president and visionary to curate and design a small exhibition of her work. At the time, Ms. Bassett was 87. Her efforts culminated in the display “Florence Knoll Bassett: Defining Modern," in collaboration with the curator Kathryn Hiesinger. Her contributions to Knoll, and to the rise of modernism in America, are immeasurable.